Count the Canadian coins and find the total amounts shown. 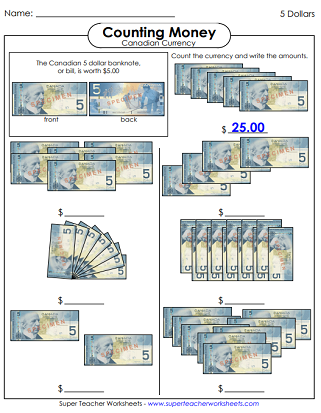 These worksheets include toonies, loonies, quarters, nickels, and dimes. Some worksheets include pennies and others so not. All coins and bills pictured are Canadian currency. We also have US Currency and Australian Money worksheets. This file has 30 task cards, each with Canadian Coins on it. These can be used for learning centers, small group instruction, or classroom games. Basic level includes only a couple coins per card. Does NOT include pennies. Each task card in this set has several mixed coins. (example: A toonie, two loonies, two quarters, and five dimes) Use these cards for classroom games or small group instruction. Does NOT include pennies. Money Game: "I have / Who has"
Students will love counting money when they play this whole-class chain reaction game. Includes pennies. Students can match coin sets with the correct money amount with this fun printable puzzle. There are any ways to use this resource. Print out this puzzle so students can match the coin sets with the correct money amount. Write the cost of each snack item at the snack shack. This is a basic-level worksheet. Only a 1, 2, or 3 coins for any items. Does NOT include pennies. Write the correct snack item next to the coins that represent its cost. All snack prices on this worksheet are under one dollar. Includes pennies. Write the name of the snack item next to the coins that show its cost. Snack prices on this worksheet are all less than five dollars. Does NOT include pennies. Write the correct snack item next to the coins that represent its cost. Snack prices on this worksheet are under five dollars. Includes pennies. Count the coins and write the value of the money shown. Includes one and two dollar coins. Amounts up to $5.90. Does NOT include pennies. Count the coins and write the money amount. Includes one and two dollar coins. Amounts up to $5.81. Includes pennies. Write the money amounts shown in each box. Amounts up to $10.00. Does NOT include pennies. Write the money amounts shown in each box. Amounts up to $9.01. Includes pennies. Count the amount shown by the paper banknotes. Write the amount on the line. 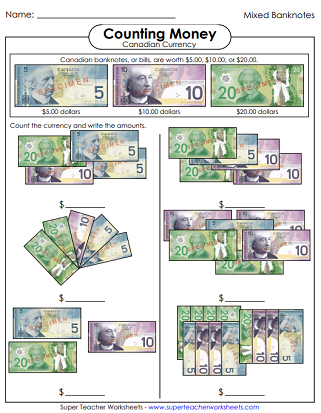 Canada banknotes. This activity requires students to find the value of coins and bills. Does NOT include pennies. Write the amounts on money shown. Includes twenties, tens, fives, and coins. Amounts up to $65.86. Includes pennies. Count the mixed bills and coins and write the value on the lines provided. Does NOT include pennies. Count the bills and coins. Then write the amount shown. Money amounts go up to $88.73. Includes pennies. How much money is shown? Count the nickels to find out. Count the dimes and write the amount of money shown. Up to $1.20. Count the Canadian quarters and write the money amount shown. Amounts up to $2.50. Count the loonies and write the money amount shown. Count the two-dollar coins on this worksheet and write the money amounts on the line. Count the five-dollar bills and write the amounts shown. Count the twenty dollar bills and write the amount of money shown. Count the pennies and write the number of cents shown. Amounts range from $0.03 to $0.12. This word wall shows all Canadian coins, including nickels, dimes, quarters, loonies, toonies. Also includes bills from five to one hundred dollars. Match the illustrations of coins/bills to the word names and the numerical money amounts. 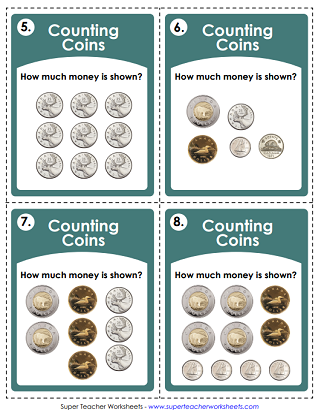 Count American coins with these printable worksheets. Includes pennies, nickels, dimes, quarters, as well as paper money. Learn about the Canadian provinces and territories with these maps, games, worksheets, and projects.